Very cold with a strong easterly wind today, even in downtown Geneva snow was being moved around and you can see a lot of snow transport has happened in the mountains. There has been around 30cm of fresh snow. MF has the risk down as 2 in the Isere although they’ve upped it to 3 for the eastern parts of the Savoie (note the avalanche incident in Valloire today). Although the first 1 meter of snow is rock solid there are now some different layers on top couple with some very cold temperatures and easterly winds which mixes up the picture. An avalanche crossed a road being used as a piste at Verbier on Wednesday morning around 10h30. No one was hit by the slide and the cause is unknown. 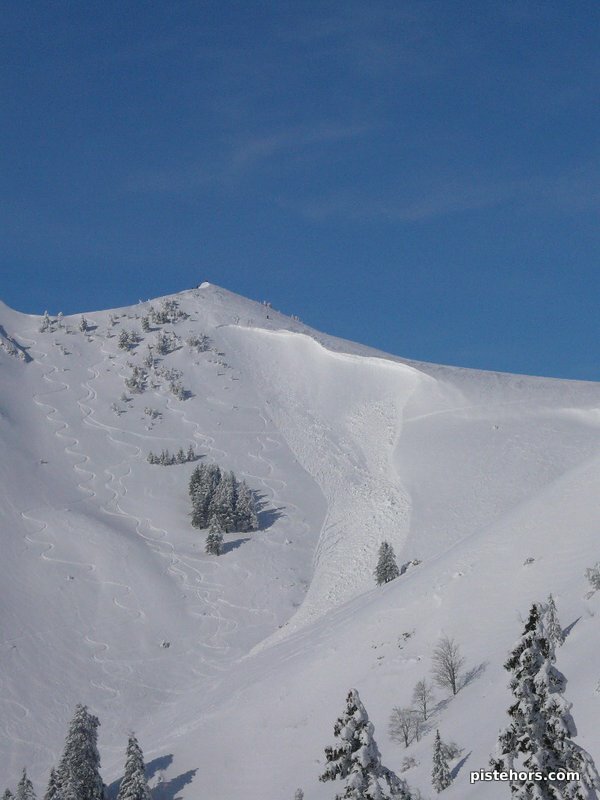 The avalanche measured 200m x 20x in the Croix du Coeur sector. last two days it been bloody cold at geneva! At last snow in the Pyrenees. Best skiing for two seasons but with it usual problems - one lad lost in St Lary since Sunday! Yes high avalanche risk still in the Western Pyrenees. Very cold in the Alps, especially with the wind at altitude. I did a rapid trip to the Couloir en Virgule (comma couloir) above the Col de Marcieu this afternoon and it was biting. There was quite a lot of snow transport under the influence of North-Easterly winds and I observed both some surface sluffing and some small slabs of 10-15cm depth, basically all the fresh snow layer. Underneath the snow was hard/icy and stable. Predictions are for temperatures to drop to -15 to 25C over the night of Saturday to Sunday depending on which forecast you believe. -15 (Meteo France’s prediction) seems most likely to me. Quite a lot of wind transport over the weekend as this snow sculpted around a tree shows. On Sunday we opted for a “Safe” route in the Chartreuse forests. It ran about 150 meters and “rockered” a brand new ski. Apart from that no other problems. The tracks which lead to the summit that someone had made crossed onto the lee slope just before the summit. With a risk 2 and given the altitude of 1700m we didn’t expect too many problems but the lesson is not to follow tracks if you have doubts about the slope stability. Particuarly when climbing. The slide came to rest in trees where the snow banked up to 1.5 - 2m depth rather than pushing through. Could have been nasty if someone had been buried or hit one of the trees in the slide, that is a lot of snow mass. Back to the Sommand avalanche. There was another slide in resort in Sunday. a 400 meter slab in the combe de Perret that finished on the Col Perret black. The PGHM from Chamonix are investigating the Saturday avalanche. It seems the group, including an instructor from the ESF (who was in her free time) was skiing down when the woman, wanting to avoid some small cliffs triggered a small slide taking her over the cliffs. Some very cold temperatures, in Chambery it was -14C, a balmy +5C above the record of 1985. -25C in the ski resorts, 19C in Bourg St Maurice. The cold continues, -10C at 300m this morning. -15C at 1500m with strong winds continuing from the North East so that means two things. Temperature Gradient and Snow Transport. The TG will destructure the snow, especially some of the harder layers but the wind will pile new snow onto these facetted crystals. It is going to continue to be sketchy. A 43 year old man from Bourg d’Oisans was caught in an avalanche on the pas de la Mine on the Taillefer yesterday at 2300 meters altitude at 15h30. He triggered a soft slab and was completely buried by the slide. His girlfriend found him with her avalanche transceiver after half an hour of searching. The man was suffering from severe hypothermia. Neither person had a mobile phone so she left her boyfriend in a snowcave she had dug and skied down to summon help, 90 minutes after the slide. The man was taken by helicopter to Grenoble hospital, specialists in severe hypothermia cases. He triggered a soft slab and was completely buried by the slide. His girlfriend found him with her avalanche transceiver after half an hour of searching. The man was suffering from severe hypothermia. Neither person had a mobile phone so she left her boyfriend in a snowcave she had dug and skied down to summon help, 90 minutes after the slide. The man was taken by helicopter to Grenoble hospital, specialists in severe hypothermia cases. If it was my missus she would have to call the bloke next door to come up and look for me! It has been extremely windy all week, winds largely from the NE. This has changed the conditions somewhat. Summits and ridges are either ice or hard snow, lower down it is a mix of ice, windblown or powder and this transforms into powder as you hit the forest. So the skiing is pretty variable. Still a risk of avalanches on lee slopes. It remains very cold. These are from snowshoes rather than skis around Isenau above Les Diablerets over a few days this week. That’s the CAS cabane, no prizes for guessing the wind direction. I think you can see from the photo the mix of snow on this little slope, just at Lac Retaud. A glade around 1400m lot’s of untouched snow, I think there’s only me that goes through here and some chamois and foxes. Nice photos, we are stuck in fog at the moment unless you go > 2000m. Things seem to be clearing now. -9C at 900m today, just a bit of piste/off piste with junior until it was too cold for him to stay out anymore. The snow in the woods is good still and we’ve had about 3cm fresh falling out of the fog every day for the last 4 days which is beginning to cover some of the old tracks. As you can see a little jump sets of a sluff so the surface 15-20cm of snow is poorly bonded to the base - which is hard although, given the -10C temperatures, I’d expect it to be rock solid. In some places the base was totally rotten, is this the affect of the cold weather? A lot of surface hoar too, although only in the trees as everywhere else the strong NE winds have scoured the snow. in fact out of the woods you could go from powder, to hard pack to sun/wind crust to windblown in the space of a couple of turns. There is still a good depth above 1100m and you can ski down to around 900m on open slopes. the prevailing wind has been from the NE for the last week whereas this would imply a NW->SE direction. What I think happened is the wind rounded a knoll and whipped over a col changing the direction locally. A good indication that you cannot 100% rely on the wind direction in the mountains and topology can have a big effect. a portent of bad weather? Well today was fantastic in the Chartreuse although it snowed only a few km away in Lyon. The snow continues to be quite slabby under the influence of the winds from the north east. About 5-15cm of fresh fell on the Chartreuse, maybe 12cm in the Belledonne mountains. Skiing it was possible to kick off small slabs on steeper (35 degree) slopes although there doesn’t seem to be much of a weak layer between the base and the fresh snow so the slabs don’t have enough energy to take more snow. This isn’t the case everywhere. Two skiers were caught by a slab today at Chamrousse between the Col de Bottes and the Croix de Chamrousse. There were no injuries but they were in white out conditions which would have made an S&R operation difficult despite the proximity of the piste patrol’s office. There is an ongoing operation in an off-piste area of Mont Joly near to Saint-Nicolas-de-Véroce. 3 skiers have been involve in a slab avalanche but no details yet if anyone was buried. Flaine, amongst other areas, has similar dangers. Some of these holes can be deep - 10 to 20 meters although they tend to be visible on the surface. This one was 3 meters deep, it wouldn’t be fun to fall in. We had two snowshoers killed in the Chartreuse some years back falling through snow into a pothole.